Thyroid, Parathyroid, Adrenal, Endocrine Surgery, What is Adrenal Insufficiency? Adrenal insufficiency can be divided into primary, secondary and tertiary. 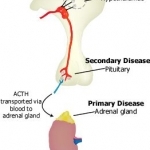 Primary adrenal insufficiency (Addison's disease) results from damage to or dysfunction of the adrenal gland itself. Secondary adrenal insufficiency results from inadequate pituitary ACTH secretion and therefore inadequate cortisol release. Tertiary adrenal insufficiency results from inadequate CRH release from the pituitary and the resultant decrease in ACTH release. Primary adrenal insufficiency is clinically distinct from secondary and tertiary insufficiency. In primary insufficiency there is a decrease in both mineralocorticoids (aldosterone) and glucocorticoids (cortisol), whereas in secondary and tertiary insufficiency the aldosterone levels are virtually normal as the zona glomerulosa is largely independent of ACTH.